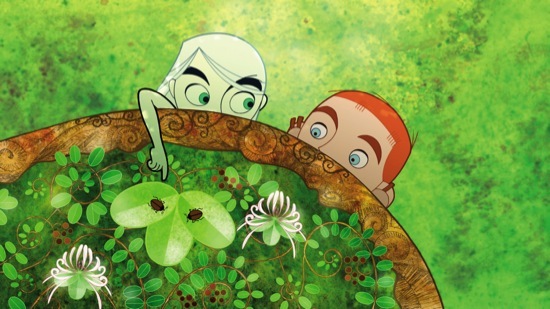 The animated film The Secret of Kells was the underdog in the Best Animated Feature category at the 2010 Academy Awards, as it was up against Pixar and Disney blockbusters like Up and The Princess and the Frog, as well as Coraline and Fantastic Mr. Fox. It may have lost to Up, but it did gain critical acclaim and a whole new audience. Now, GKIDS Inc. has announced the release of the graphic novel version of The Secret of Kells, written and drawn by creator Tomm Moore. The full-color, 110-page, graphic novel will be available on the Comics by comiXology app for the iPhone, iPad, iPod Touch and the web ($4.99 download). A free 22-page preview app (read online here) features “Prequel 1: Brendan,” telling the origins of the main character, Brendan, and his rescue from barbarian attacks as a young child. In addition to the prequel story, the free preview app features additional sample pages from the full graphic novel, a link to download the film on iTunes, and four extended video clips from the movie. The Secret of Kells graphic novel will be introduced at the 2010 Comic Convention in New York City by Tomm Moore, with a demonstration at the New Video booth (#1665) on October 9. Tomm Moore will also be appearing on a panel October 10 with Secret of Kells art director Ross Stewart, where he will discuss the creative process behind the animation of the film. Both The Secret of Kells graphic novel and DVD/Blu-ray were released on October 5th. SYNOPSIS – Magic, fantasy, and Celtic mythology come together in a riot of color and detail that dazzle the eyes, in this sweeping story about the power of imagination and faith to carry humanity through dark times. Young Brendan (Evan McGuire) lives under the care of his uncle Abbot Cellach (Brendan Gleeson), in a remote medieval outpost under siege from raiding barbarians. One day a celebrated master illuminator (Mick Lally) arrives from foreign lands carrying an ancient but unfinished book, brimming with secret wisdom and powers. To help complete the magical book, Brendan has to overcome his deepest fears on a dangerous quest that takes him into the enchanted forest, where mythical creatures hide. It is here that he meets the fairy Aisling (Christen Mooney), a mysterious young wolf- girl, who helps him along the way. But with the barbarians closing in, will Brendan’s determination and artistic vision illuminate the darkness and show that enlightenment is the best fortification against evil?